Zürich today is much more than a sleek, cosmopolitan financial capital which enjoys the finer things. Its lakeside position means it's not just clean, it's beautiful. And its large expat and student population means it's also arty, vibrant and possibly even 'happening'. 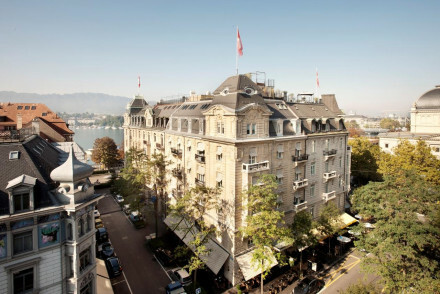 The Hotel Guru's recommendations for the best places to stay in Zurich offer something for everyone; from the trendy and great value 25 Hours to the Dolder Grand, a renowned five star establishment with views to die for! The elegant lake means that in summer Zurich has plenty of water based activity on offer, as well as Europe's largest street party. And in winter Zurich is a gateway to the snow of the alps - if you're here in February you might even see snow in the city. So there's action as well as culture here. 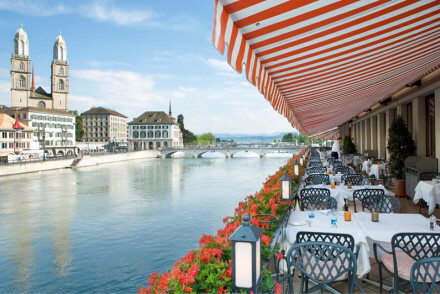 On the Limmat river's left bank are the upmarket shops, crowded along the Bahnhofstrasse, and on the right bank, the Nirderdorf, you'll find the bars and antique shops. Along the river itself you'll find artist's studios romantically crammed in between cafes, and you'll possibly even stumble across the Cabaret Voltaire, where the Dada movement was founded back in 1916. 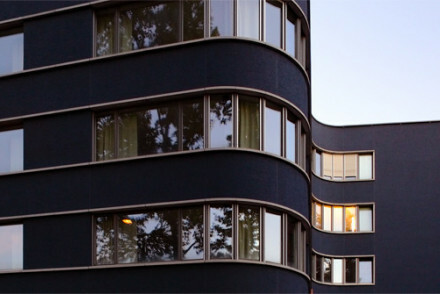 For more art visit the Kunthaus, where you'll see works by Munch, Monet, Picasso, Rothko and Warhol. Or one of the other hundred or so art galleries! On top of the galleries, Zurich has fifteen museums, a zoo and an opera house. And the local tram system makes it easy to navigate. The old town - overlooked by the towering 'pepper pot' towers of the cathedral, this charming district is a realm of coffeehouses and chocolate shops. A third of Zürich's population aren't Swiss passport holders, and those who do have a Swiss passport aren't guaranteed German speakers, you'll hear a lot of French and English in Zürich as well. Don't forget that the city is a busy year round destination for both business and leisure travellers. 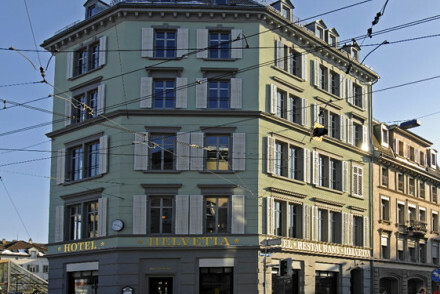 So if you want to guarantee a room in one of the best places to stay in Zurich, don't leave it till the last minute! Eight medieval townhouses have been joined up to create the cutting edge design of the Widder Hotel. Five stars worth of ultra modern cool, including excellent food, service and music, this hotel politely yells comfort and style. Vibrant and funky, the 25 Hours Hotel is also one of the best places to stay in Zürich if you're on a budget. This is a colourful spot great for kids, and though it's slightly out of centre, in the financial district, it has its own fleet of free bikes, and of Minis. Right on the river, in the centre of the old town, the Storchen has been a hotel for 650 years. The public rooms have plenty of charm, and while the bedrooms are a bit dated, they're spacious and comfortable. 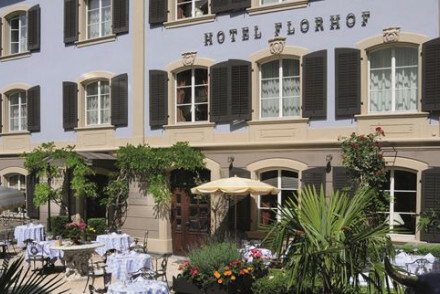 The Florhof Hotel is in a quiet corner of the old town, a converted merchant's house around a sunny courtyard. Cosy and close to the museums, theatres and shopping district. The B2 Boutique Hotel and Spa occupies a former brewery, but the conversion is exceptional, giving the building a spectacular rooftop swimming pool and wonderful wellness centre. Plus a library lounge featuring around 33,000 titles which you are free to borrow. The Alden Luxury Suite Hotel is a five star collection of rooms and suites in a beautiful building close to the lake and the old town. Elegant and grand on the outside, the interior is all contemporary luxury. The Greulich Hotel has been converted from a 70s era commercial building, into a cool, minimalist boutique hotel in a funky neighbourhood. 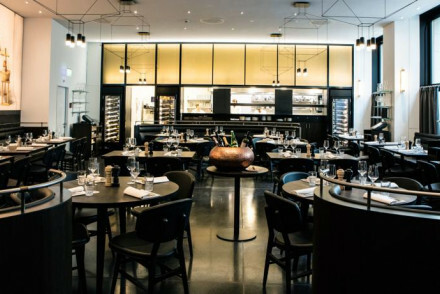 Monochrome and stripped down, this hotel also has an acclaimed 'slow food' restaurant. Regal 10th Century palace, the Baur au Lac's guestbook is an impressive read; there's Alfred Nobel, heads of state and royalty. Opulence and service for the most discerning of clients, and a Michelin starred restaurant. 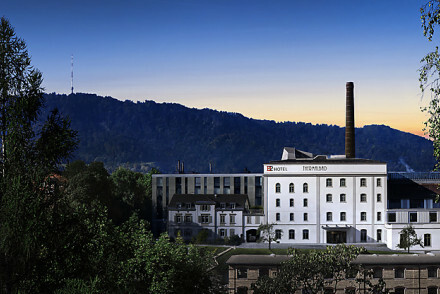 The Dolder Grand is fabulously luxurious, a fairytale palace of a hotel overlooking Zürich, the lake and the alps. The spa is vast and its traditions in hospitality are unimpeachable. If you think that you'd rather have your own space, then visit our online partner, booking.com, for a wide range of apartments in the city centre. Fly to Zürich Airport located just 10km (6 miles) from the city centre or if travelling overland Zürich Hauptbahnhof has excellent connections to destinations both around Switzerland and Europe. Best time to visit - Zurich is a year round destination, but for long days and warm weather June to August are the most pleasant with temperatures averaging around 21°C. Or contact, one of our friendly gurus for advice. 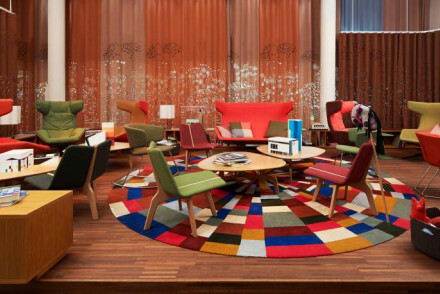 Part of the vibrant urban 25 Hours Hotel group, this funky, colourful contemporary hotel is in Zurich West, the financial district. Restaurant, gym, pet and children friendly. A lively bet for business or a weekend away, the hotel comes with its own bicycles and a groovy fleet of Minis for guests. Quiet urban oasis in residential area in Zurich West, a trendy neighbourhood with nightclubs & boutiques. A 70s commercial building has been converted to a minimalist boutique hotel with monochrome stripped down bedrooms. Central courtyard planted with birch trees. Acclaimed 'slow food' restaurant. Sights nearby - Easy access to all that Zurich has to offer. 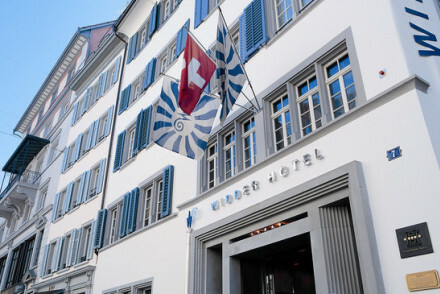 Clean and chic city hotel in central Zurich. 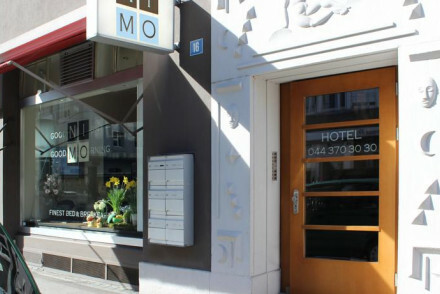 Art nouveau rooms and apartments, modern Swiss cuisine, and popular lively bar. A very cool spot for a weekend in Zurich, in an unbeatable location, and ideal for business or leisure. 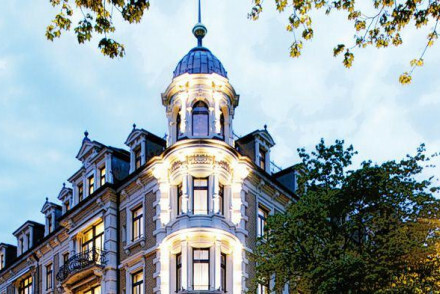 Romantic 4-star boutique hotel in Zurich set in the north-east wing of the Grand Utocastle, a 19th century neo-Baroque building. Ideally placed to explore the city's rich cultural fabric, be it the churches, art galleries or operas. The rooms are warm and traditional, with artworks and antiques. Local exploring - A highly central location, whether you're shopping on the Bahnhofstrasse avenue, attending the opera or viewing local churches. Sights nearby - Visit the famed Chagall windows inside Fraumuster Church. An unexpected quiet oasis in the old town, this romantic, shuttered, former merchants town house has a sunny and flowery courtyard garden. Good food and wine in the GaultMillau listed restaurant. 35 pretty cosy rooms, close to the museum, theatre, university and famous shopping district. A Grade One heritage building disguises a seriously trendy boutique within, not to mention one of the top bars in town. Sights nearby - Five minutes walk from both Rathaus Zurich and Grossmünster. Great walks - Great walking routes around the nearby Zurich Lake. A chic and stylish bed and breakfast in a central location. Close by to restaurants and a tram station. Rooms are comfortable, some with balconies. A breakfast room serves a delightful buffet with varieties of Swiss cheese. A simple yet perfectly formed stay. Landmark brewery converted to boutique hotel. Modernistic five star bed and breakfast with fabulous spa and swimming pool. Well-equipped and sleek contemporary rooms, and atmospheric public spaces. Swimming Pool - Fabulous rooftop pool open year round. 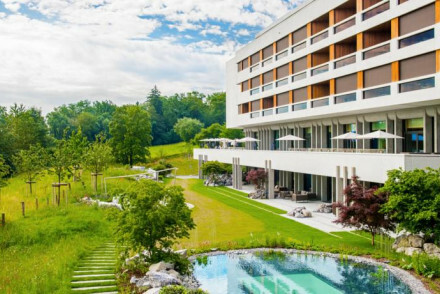 Chic Five Star boutique hotel close to Zurich lake and the Old Town. Built in 1895 in a handsome listed building with sunny outside terrace. Geared for business or pleasure. Elegant suites, excellent restaurant, bar and library. Sleek staff make sure that guests' visits run like clockwork. Sights nearby - Most attractions can be reached within 5 or 10 minutes on foot. 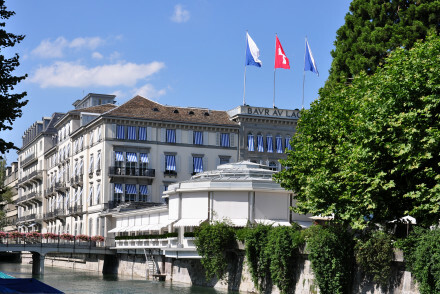 Centrally situated in Zurich's Old Town, on the River Limmat. The Storchen has been a hotel for 650 years. Legend has it that it was named after two rare black storks which nested on its roof. Hospitable, excellent service & good food. Bedrooms are 80s style but ideal for business or pleasure. Good wine list - Exceptional cellar. An urban retreat blending history with luxury. Built in the 1970's, beautifully renovated with elegance, rooms are spacious and grand. A sit-out terrace offers wonderful views. Choice of two restaurants and a legendary bar that has seen many celebrities. Stylish chic. This regal 19th-century palace hotel is an institution. Guests have included royalty, heads of state, artists and Alfred Nobel. Magnificent roof top fitness centre. Opulent rooms together with the latest technology for the most demanding of clients, plus Michelin starred restaurant. Take eight Medieval townhouses & join them together using the best architects & designers to create a cutting edge Five Star Hotel. Ultra modern, faultless service, supremely comfortable. Well situated in the Old Town on the banks of the Limmat. Cool, aesthetic, hard to beat in every department. Fabled, superbly grand Five Star turreted establishment with magnificent views overlooking Zurich, the lake and the Alps. All the ingredients for the most discerning guests for either business or pleasure. Sumptuous spa, first class cuisine, and luxurious suites.